As close as can be determined all these years later, Stock Car racing in the Ottawa area began in 1949, on a flat track cut out of a farmers field near the hamlet of Carsonby, approximately 30 miles south of the capital. Public interest then was light however, so this track was abandoned after only one season. A second attempt to bring this increasingly popular sport to eastern Ontario was undertaken a year or two later, in another field just west of the village of Bells Corners. It was also a dirt track, constructed this time with banked corners, and operated as Meadow Park Speedway. But it too did not garner sufficient support to stay in operation. It became obvious that for Stock Car racing to be truly accepted by, fans, drivers, and sponsors, a more central, easy-to-get-to location , with large-capacity bleachers, floodlights, a PA system, and convenient public parking was required. Wally Pullen (#30) is stuck on the railroad ties and Bob Coates (#22) spins in turn 3 - May 1956. Photo taken by Ted Grant. Copy provided by the Ottawa City Archives. So, on June 1st 1955, after much negotiation, the first evening of stock car racing was held at Ottawas Lansdowne Park stadium, around the outside of the CFL Ottawa Rough Riders football field. This venue, which is also the site of the Central Canada Exhibition (CCEA), provided all the required facilities, and stock car racing in Ottawa finally took off. More than 5000 people came out that first night to watch this exciting form of entertainment, around the ¼-mile dirt oval (former horse-racing) track. 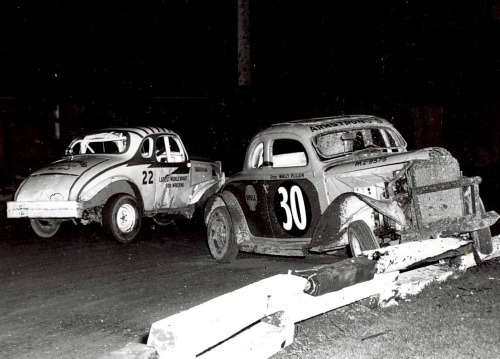 By 1956, there were more than 40 local cars and drivers registered with the Lansdowne Park Stock Car Racing Club, and local businesses, mostly from the local automotive trade, eagerly sought to sponsor a car, so that their name would gain the prominent exposure offered at Lansdownes weekly races, every Wednesday evening. After two very successful seasons, race promoter, Gerry Bisson, in cooperation with the CCEA, initiated some major improvements to Lansdowne Speedway, as it was then being called. They lengthened the track to 1/3 of a mile, widened it to 40 ft, increased the banking on the corners, paved it over, and added a highway-style guard-rail to surround the tracks perimeter. A new, more extensive set of safety rules was approved, and Lansdowne Parks Speedway opened the 1957 season in a very professional manner. Late-model events, Sprint races, occasional powder-puff races, and a demolition derby were included now as special attractions. For three more summers. Lansdowne Speedway continued to be one of Eastern Ontarios top Stock car racing venues.. And, as the popularity of stock car racing increased, additional races were scheduled for Fridays and/or Saturdays, drawing competitors from as far away as Montreal, and from upper New York State as well. Their mounts were mostly well-used 1930s coupes and coaches whose next owner would be a local wrecker. But the entertainment value provided by the drivers in their rather simple cars was undeniable. And, the local stock-car promotion business was lucrative. 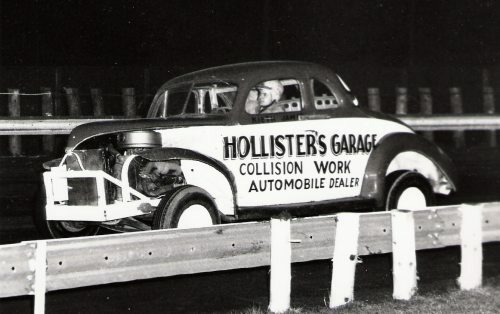 Keith James in the Hollister Ford, May 1957. A 17 or 18-year old car, with a brand-new OHV, V-8 engine. Photo by Ted Grant, courtesy of the City of Ottawa Archives. This growing enterprise faced one major problem, however. Lansdowne Park was, and still is, surrounded by residential neighbourhoods whose residents eventually became irritated by the noisy activities each race night from May through to the end of September. Public pressure was mounting to end the races at this location. In addition, the Rough Riders and the CCEA were developing plans for the construction of south-side bleachers, and for the replacement of the ageing grandstand, with what was to become the Ottawa Civic Centre. A race track for cars would no longer be accommodated, despite the regular, weekly income generated for the CCEA by track revenues. Lansdowne Speedway hosted its last evening of racing on August 17th, 1960. Mr Bisson then undertook the construction a new, state-of-the-art racetrack, on Hwy 7, near the town of Stittsville, west of Ottawa. Back in a rural area again, but with the Capital areas interest in stock car racing now firmly established, Capital City Speedway opened for business, in 1961, where the Ottawa Valleys stock car tradition continues to this day. It continues to operate as the Ottodrome International Speedway, which now also includes a drag-strip, in addition to the familiar oval. The Ottawa Civic Centre was eventually completed in 1967, with Lansdowne Park continuing as the home of the Rough Riders until 1995. For several years, the stadium sat vacant most of the time, until the CFLs new Ottawa Renegades appeared . Unfortunately, few people remember, that for six years, this site was also one of Ontarios most popular, and prosperous, stock-car race tracks, known as Lansdowne Speedway!